The Metropolitan Pavilion – “It feels so yummy!” declared the front cover of the look book for Scanty by Mickey Sills, who was granted his first fashion show thanks to winning the inaugural Mercury Milan Style Award. 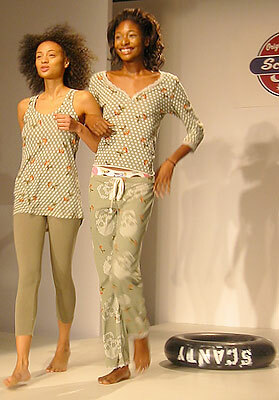 Indeed, the light-as-cotton-candy parade of cheeky prints resembled a pajama party rather than a runway event. The bikini briefs and tops, drawstring pants, tank tops and short nightgowns bore fun designs that included images of vintage automobiles, whales and skulls. The sleepwear, which came mostly in soft pastels and colors, managed to retain comfort yet make the statement that no matter how old you are, there’s nothing wrong with being a child at heart. The models – who skipped, danced and flirted with audience members throughout – could certainly attest to that, capping off the rollicking show with a pillow fight!